Canada's minister responsible for the NAFTA renegotiation says she is "very encouraged" by reports of progress between the U.S. and Mexico, but it's unclear when Canadian negotiators will rejoin the talks. Canada's minister responsible for the NAFTA renegotiation says she's optimistic after reports of progress between the U.S. and Mexico, though it's unclear when Canadian negotiators will rejoin the talks. "We are very encouraged by what we are hearing from our NAFTA partners," Foreign Affairs Minister Chrystia Freeland said on her way into the federal cabinet's retreat in Nanaimo, B.C., on Wednesday, adding that she's been "in close touch" with both the Americans and the Mexicans this week and throughout the summer. "We're hearing optimism from them about the work they're getting done on the bilateral U.S.-Mexico issues," she said. "Very central there is rules of origin on cars." The North American Free Trade Agreement allows auto parts and vehicles manufactured in North America to flow freely north and south between the three countries. But based on American concerns, negotiators are revising the definition of what constitutes a North American automobile — or even a North American part — for tariff purposes. The Americans want to keep foreign steel out of vehicles that receive preferential treatment under NAFTA. They also want a new deal that addresses the significant wage gap between what the people who assemble these vehicles make in Mexico, versus Canada or the U.S. — labour cost savings that offered an incentive for plants to move south in the past. Freeland declined to offer specifics on what kind of a compromise might be in the works, saying she'd let the other two countries talk about that. The three countries spent a lot of time discussing automotive rules last spring, she said, and Canada had already reached "some high-level agreement on some philosophical principles" with the Americans. "Obviously, rules of origin is an issue where detail matters. And Canada will very much have a voice in the finalization of all these details," she said. The three parties have agreed that once work on the bilateral issues is done, trilateral talks will resume. 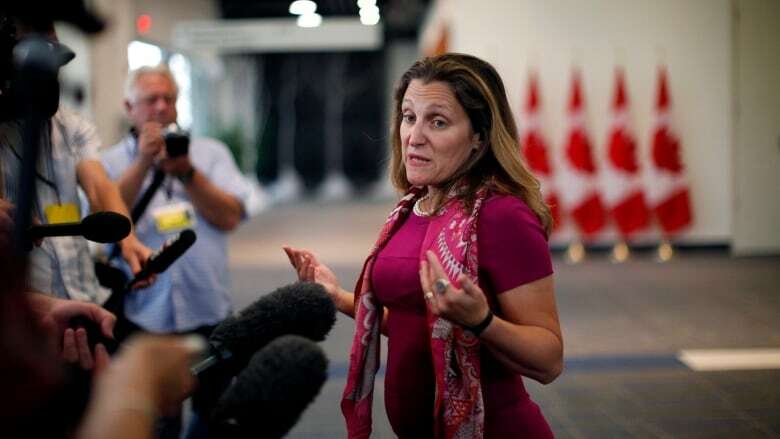 "Canada is looking forward to joining the negotiation and a swift conclusion of the NAFTA negotiations," Freeland said. A report by Politico late Tuesday suggested a "handshake deal" was possible between Mexico and the U.S. But in a statement sent to CBC News and other outlets, the office of U.S. Trade Representative Robert Lighthizer said through a spokesperson that "there is no deal on NAFTA. There are major issues outstanding." Mexico's economy minister, Ildefonso Guajardo was back at the USTR office again Wednesday, as five weeks of talks between the two countries continued. He suggested there are some competing agendas between Mexican officials like him, representing the outgoing president, and the negotiator who will be taking over the NAFTA file later this year, Jesus Seade. Mexican negotiators were under pressure to try to reach an agreement by the end of this week in order for something to be signed before the government changes hands. "A breakthrough, really, is when you finish everything, isn't it? We hope that we have a solution in the next couple of hours or couple of days," Guajardo said. "I think the handshake happens when everybody is done." Jared Kushner, U.S. President Donald Trump's special adviser and son-in-law, has told reporters that negotiations are going well. "I'm not going to get ahead of any potential announcement," said White House spokesperson Sarah Sanders Wednesday. "We'll let you know when we have an announcement." "It looks like it might be some American officials doing a handshake of one," said Laura Dawson, director of the Canada Institute at the Wilson Center in Washington. "I'm not very optimistic that there's much substance there. I think we have to really differentiate between progress and a finish line and political theatre." "Whatever deal that the U.S. and Mexico can work out together, Canada could probably live with, because the U.S. has got similar wage rates and similar standards and similar objectives," Dawson said. "But at the same time, it probably doesn't want to be in the room if the U.S. is slapping Mexico around." The three parties had not been expected to announce an agreement until Canada returned to the negotiating table. "I don't hear any of the technical people … any of the people who are intimately familiar with the complexity of the negotiations with the content of the various chapters … coming forward with very optimistic assessments of settlement within a couple of months," Dawson said. For now, Freeland remains in Nanaimo at the federal cabinet retreat. Canada's ambassador to Washington, David MacNaughton, had been expected to brief ministers as part of their retreat Wednesday, but officials from the prime minister's office led those discussions instead. Late Wednesday, a spokesperson for the Mexican negotiating team said talks between the U.S. and Mexico would continue Thursday morning in Washington.